So as a user looking to have a fun game or two or ten of poker, why should you care about the platform? And if you do care about it, what should you look for in the platform? This section will answer those questions. RNG is short for Random Number Generator, a mathematical program that is employed to create unpredictable patterns that will generate a completely random distribution of cards in online poker. This ensures that the selection of cards is completely guess-proof and each of the 52 cards has an equal chance of being selected. It also ensures that no individual player can get “better” cards than the other by design. True randomness is difficult to achieve mathematically, and a lot of research has gone into developing such programs and also in testing and certifying them. In general, a sequence of truly random numbers should be such that any repetitive pattern should be avoided, and any sequences that result from them, should be impossible to predict or calculate. Various mathematical approaches and algorithms have been used to generate random numbers. This wikipedia article describes the Mersenne Twister, the most widely used algorithm that was originally developed in 1997; a variant of this developed in 2006 called the SIMD-oriented Fast Mersenne Twister (or SFMT) is used to generate random numbers in 9stacks. Indeed, we use a combination of this algorithm as well as a hardware generator to ensure a further layer of security. Who certifies that our RNG is working properly? 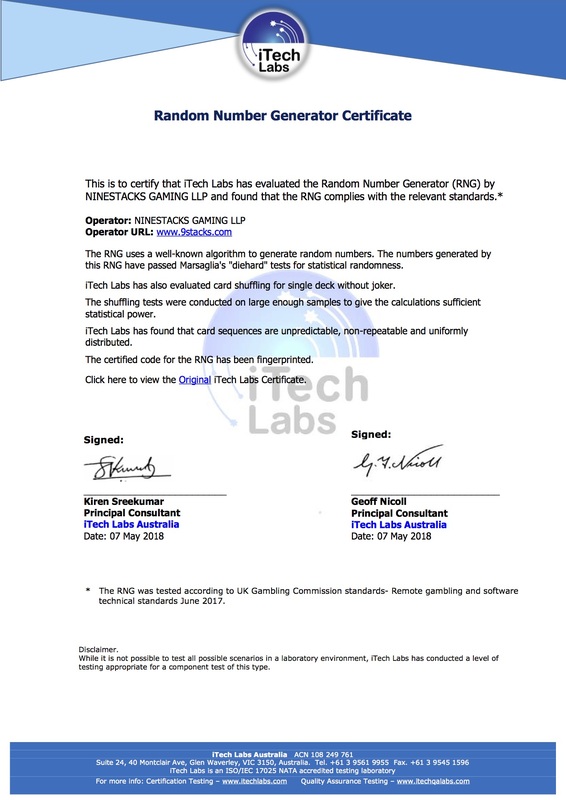 This is to certify that iTech Labs has evaluated the Random Number Generator (RNG) used and found that the RNG complies with the relevant standards. The RNG uses a well known algorithm in combination with a hardware RNG to generate random numbers. The numbers generated by this RNG have passed Marsaglia's "diehard" tests for statistical randomness. iTech Labs has evaluated single deck card shuffling for Poker games. The shuffling tests were conducted on large enough samples to give the calculations sufficient statistical power. iTech Labs has found that the card sequences are unpredictable, non-repeatable and uniformly distributed. The certified code for the RNG has been fingerprinted. How RNG works: the non-mathematical version. RNG is like Batman. Ensures there is fair play at 9stacks. Always. If you make a payment to any website, you will need to provide your credit / debit card details, or perhaps your bank account details. How securely are those details stored? Obviously, you want to *really* make sure that data is not leaked. Like, really really sure! So is 9stacks PCI-DSS compliant? Yes. We work exclusively with 3rd party payment gateways and integrators that have PCI-DSS compliance built in. We ourselves (at 9stacks) never even see your card data - we currently use PayU as our payment gateway, which also powers payments for companies like BookMyShow, GoIbibo and Snapdeal. All sensitive data is handled using 128 bit SSL encryption; all PayU servers are PCI DSS compliant; any data that needs to be stored is kept in PAyU’s PCI DSS compliant Vaults. Therefore, peace of mind for you. 3D Secure is the industry-leading standard for credit card payments, and is designed to make online shopping transactions safer by authenticating a cardholder's identity at the time of purchase, through the likes of Verified by Visa and MasterCard SecureCode. We do not store your credit card or debit card details. 9stacks takes great measures to ensure that the users we have on our platform are genuine and verified. At the time of registration, we record cell phone along with the user ID. Before the withdrawal of your winnings on the platform, you will be asked to submit your name, PAN card details and bank account details. If required, other government authorised proofs of identification could be asked as well. All of this ensures that all players on our system are genuine and verified, and playing with unique accounts. If at any time we find out that a person is using multiple accounts, he or she will be kicked out promptly. Why do we do this? One, we want to ensure that you can never be on a table playing two players but in reality they’re controlled by the same person as that person then has an advantage against you. Second, we do not want “chip-dumping” - one person deliberately losing money to another account to avoid tax etc.